Introduction: I am republishing selected posts from Cohencentric, my former Leonard Cohen site, here on AllanShowalter.com (these posts can be found at Leonard Cohen). When this entry was originally posted Jan 8, 2010, I stipulated that a large proportion of readers may well know the origins of “So we struggle and we stagger / down the snakes and up the ladder.” It turns out, however, that lots of fans familiar with Closing Time are unaware of the object to which those lines allude.1 And even if one already intuitively recognizes the allusion, these lyrics still offer insight into Leonard’s exquisite songwriting skill. The short answer to the question of the origins of the lyrics, as anyone who spent his or her childhood years in a British-speaking rather than American-speaking region – such as Canada – knows, is the children’s game first called and in the UK, still called Snakes and Ladders. The confusion arose because of those always troublesome American colonies, now marketing themselves as the United States. 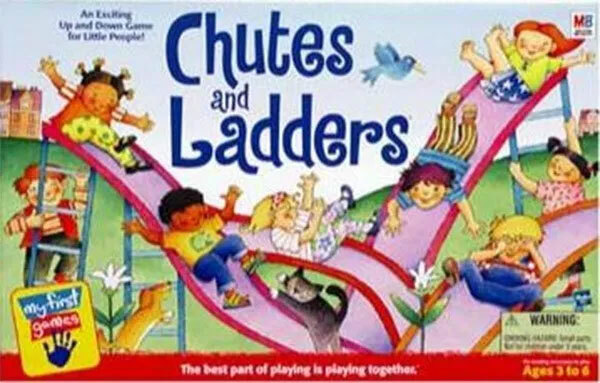 In the Milton Bradley game sold in the US, snakes were replaced by chutes (aka playground slides) with a consequent name change to Chutes and Ladders. Now, a psychiatrist trained at a psychoanalytically oriented institute (that would be me) might well comment that there are certain implications of a changing a game sporting phallic snakes to one featuring yonic chutes. But there is, inevitably, more. 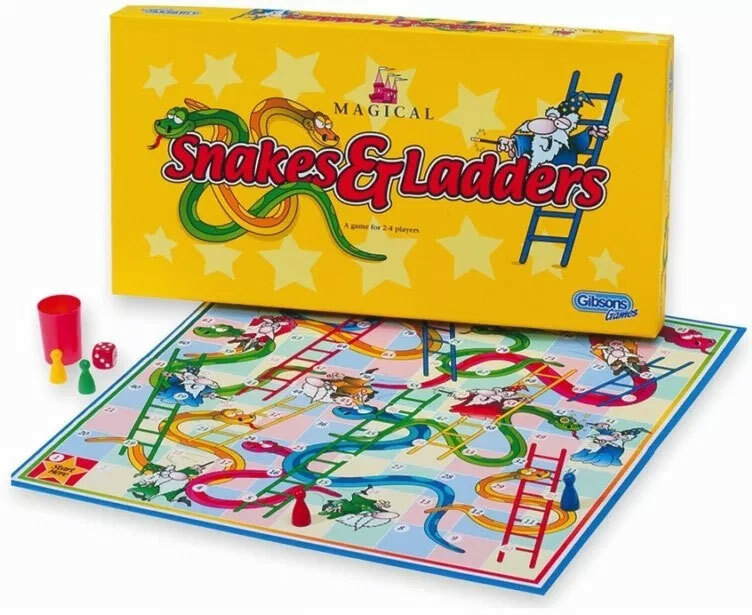 This may be another “everybody knows” thing that was a revelation to me only because my childhood toys included neither Chutes and Ladders or Snakes and Ladders.2 In any case, I was unaware of the game’s blatant moral didacticism. Snakes and Ladders has been a favourite race game in Britain for over 100 years. 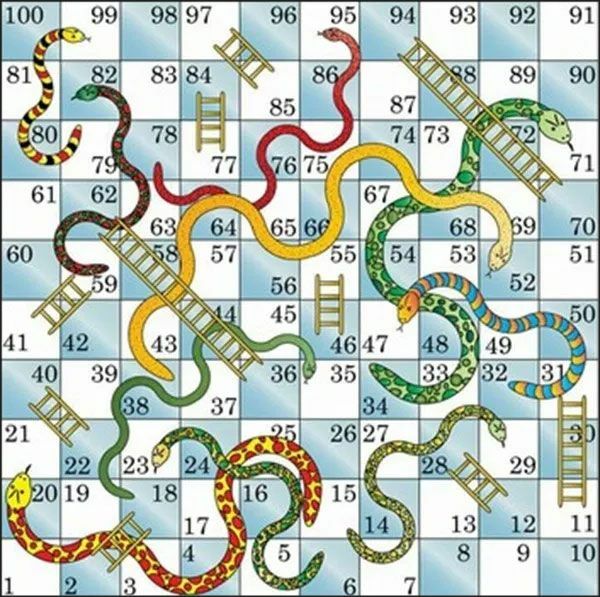 When it was originally devised Snakes and Ladders was a moral game with virtues in the shape of the ladders, allowing the players to reach heaven quickly, while the vices, in the shape of snakes, forced the player back down. 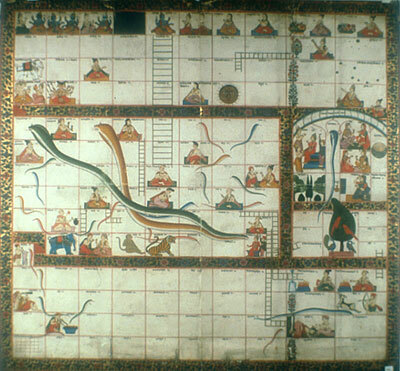 Snakes and Ladders is probably based upon a very old Indian game called Moksha-Patamu (see below), which was used for religious instruction and had 12 vices but only 4 virtues. According to Hindu teaching, good and evil exist side by side in man: but only virtuous acts – represented by the ladders – will shorten the soul’s journey through a series of incarnations to the state of ultimate perfection. Human wrongdoing symbolised by the head of the snake leads to reincarnation in a lower, animal form. The most widely known edition of Snakes and Ladders in the United States is Chutes and Ladders from Milton Bradley (which was purchased by the game’s current distributor Hasbro). It is played on a 10×10 board, and players advance their pieces according to a spinner rather than a die. The theme of the board design is playground equipment–children climb ladders to go down chutes. The artwork on the board teaches a morality lesson, the squares on the bottom of the ladders show a child doing a good or sensible deed and at the top of the ladder there is an image of the child enjoying the reward. At the top of the chutes, there are pictures of children engaging in mischievous or foolish behavior and the images on the bottom show the child suffering the consequences. and the holy spirit’s crying, Where’s the beef? is in danger of being just one more phrase that pays, easily lost in the densely figurative lyrics. The imagery evoked by these lines is precisely on point (especially in the final version compared to the earlier iterations), not only within the context of the song but also as its own free-standing, compact, powerful portrayal of individuals contending together, however transiently, in a desperate effort to claim a bit of happiness within the restraints of their self-imposed intrapsychic restrictions, the absolute limitations imposed by time, and the explicit and implicit restrictions of social mores. And that’s how Leonard Cohen has fashioned a few words alluding to a Canadian child’s game into a concise, distinctively operational contemporary version of the Sisyphus myth. Just another day in the iconic singer-songwriter biz. MindSpin January 8, 2010 at 1:29 pm: Snakes and ladders have many mythical and religious connotations. Cohen opens a fistful of words and unleashes constellations. We see as much as we are equipped to see, at any given time. After viewing the interview you posted earlier this week, I can’t help thinking of his remarks on our “apocalyptic dance.”“Closing Time” seems an especially apt metaphor for this moment (or century) in human history. That in no way subverts its relevance to individual experience, of course. What is mortality but cyclical and staggered apocalypse? And what more constructive response than to dance while dancing is possible? That way, though death robs us in the end, at least we have not robbed ourselves or each other of gifts life casts at our feet. Even as we leave the stage, it is good to bury our faces in the roses we found there. Herb Bardavid August 20, 2015 at 10:02 pm: Alan:Thank you so much for this. I played Chutes and Ladders with my children 30 years ago and never knew what I was doing. And of course any enlighten on Mr. L.C. is more than welcomed by me. You are not the only one wanting to understand as much as possible of our dear friend. Anja August 21, 2015 at 4:32 am: As a (continental) European, changing the name of the game from “Snakes and Ladders” into “Chutes and Ladders” strikes me as typically American: apparently even going down has to be fun! 😉Allen, I very much like the background information that you give regarding this part of the lyrics, thank you! 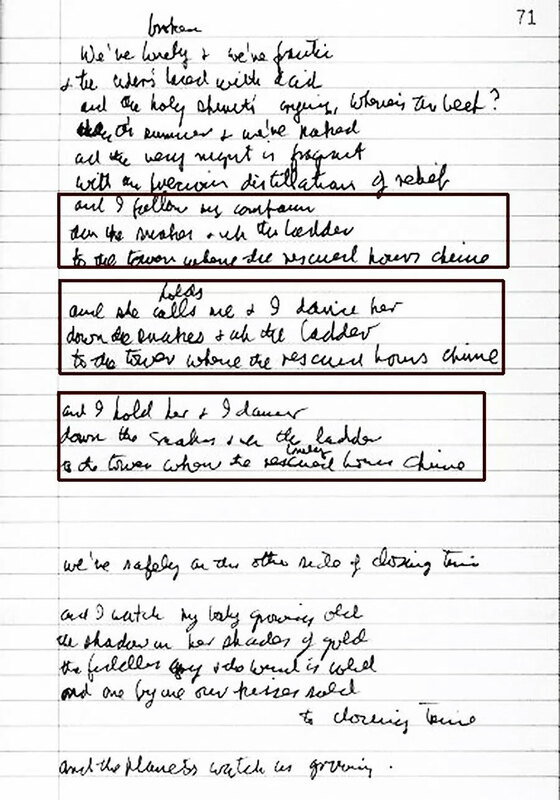 I find it very interesting how Leonard uses concise symbols to communicate in his lyrics and poetry, and how they are able to open up whole worlds of visualizations (I will not be able to hear the song anymore without seeing the gameboard in my mind), associations and (common and personal) experiences. That’s one of the reasons that I never get bored by his lyrics. I sometimes compare them to zip-files (a symbol in itself); there is more to them than you see at first sight.